In the classic style, this is one of the longest Side or Alter Tables known. Although of monumental scale and majestic proportions, the Table’s presence is one of quiet elegance and restraint. The solid top of superbly colored huanghuali wood has a magnetic luster to its richly grained surface, as if an inner light was shining through from below. Also, the raised carving of the dragon masks (taotie) found on the spandrels should be noted for the spirited vigor of its well balanced composition. 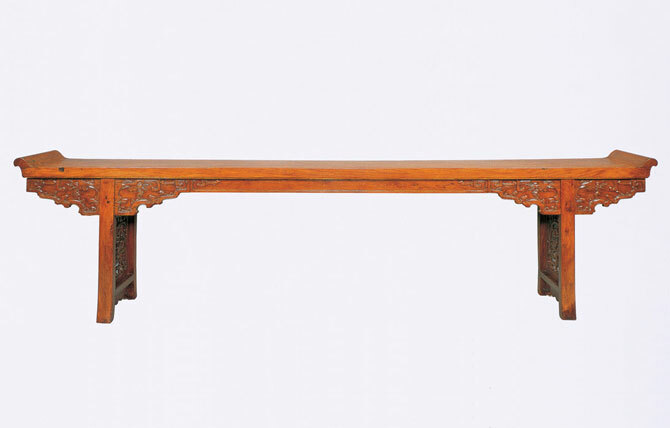 Due to the rarity of its size, materials, decorative motifs, and perfectly executed design, this Table is beyond compare and should be considered of the highest rank in the Ming furniture art form. This table can now be viewed in the Chinese Rooms at the Minneapolis Institute of Arts.